Perhaps one of the most thoroughly ignored genres of music of the last forty years. The trouble is, when your music is a silo of strange, make-up-infested faux-cowboys with ludicrous hair, flaming codpieces and guitars featuring primary colours that even The Wiggles would find garish, it’s very difficult to get anyone to take you especially seriously. And yet this is a genre of music that sold by the bucketload. In the US, Guns n Roses, Def Leppard and Bon Jovi all had albums that sold more than Michael Jackson’s Bad, U2’s Joshua Tree, George Michael’s Faith and Madonna’s Like A Virgin. 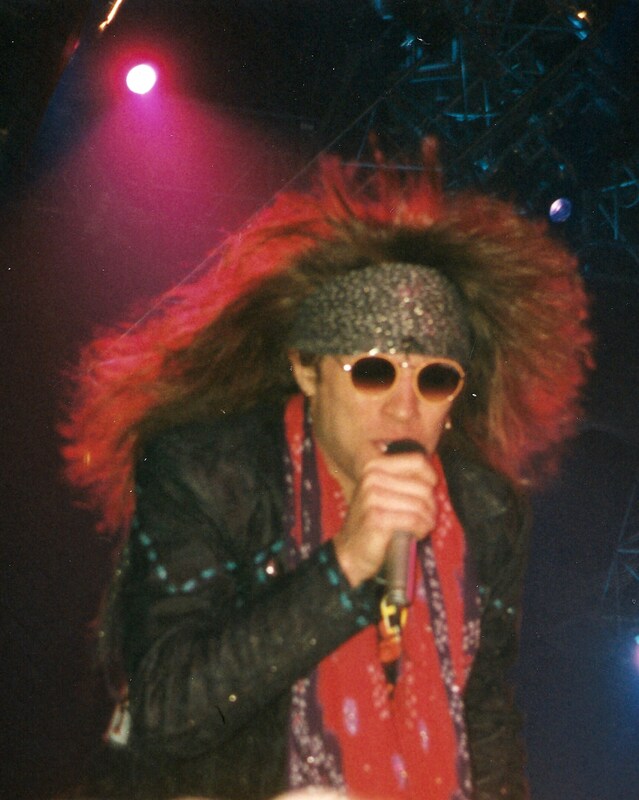 As it happens, one of those people was Justin Quirk, the author of a new book, “Nothin’ But A Good Time” that takes a look back at those days and tells the story of all these hair-sprayed men and women: the story of Glam Metal. Justin: “I’ve been kicking it around for about three years. I’ve loved this music since I was a kid, and it’s one of those things which seems to get stranger the further it recedes into the distance. It exists within quite a tight time frame (I’d say 83-91) in a way that most genres don’t, and has a lot of elements which make it seem both very of its time, but also quite unlike anything else. It was enormously commercial in vast numbers of places, yet how often do you ever meet someone who admits to having been really into Dokken, or Ratt, or Poison? And as we re-examine more and more of our culture from the past, it seemed like a glaring omission – this one kind of music which almost uniquely won’t be rehabilitated, in fact won’t even be ‘looked at seriously.’ I’m generally interested in why certain cultural trends occur when and how they do, and I felt like there had to be a story there which was worth telling. Why do you feel glam Metal was so popular…? And what factors contributed to its demise? Two reasons for its popularity: the superficial one is that it’s just solid pop music. For all the shock value, there are some absolutely brilliant bits of songwriting underpinning a lot of this stuff. Secondly, I think it functioned as the soundtrack to a very particular era in America. Think of the seventies – the country is going bankrupt, you’ve got all the disillusion from the end of the sixties, Vietnam etc, and the culture becomes very neurotic and inward looking. Taxi Driver, Jaws, Towering Inferno – all these things which speak of the place falling to pieces. Reagan arrives in the 80s and says ‘It’s Morning In America Again’ and the country sort of rediscovers its confidence and everything becomes bigger and brasher: action films, advertising, modern art, shoulder pads. But there’s something a bit weird and superficial about it, and for me, glam metal is the musical iteration of that: it’s kind of hyper-American, almost like something out of a John Waters film. And as the decade goes on – and particularly when the cold war ends and the country can stop fighting a foreign adversary and take a long overdue look at itself – everything starts to curdle and turn a bit dark. I think Appetite For Destruction marks the point where that starts to happen. In a way it mirrors that souring of the sixties, from flower children at the start to Altamont at the end. As for the demise, I think it just collapsed under its own weight – genres built on shock and awe can only really have quite a limited lifespan. Why are the likes of Poison, Motley Crue, Whitesnake, Def Leppard and co now so vilified and or dismissed? Is it not fair criticism because of the way they looked and the shallowness of the subject matter they wrote and sang about? There’s definitely an element of us now being quite an earnest culture which takes itself rather seriously, and Motley Crue are the antithesis of that. There’s a great scene in The Wrestler where they’re bemoaning the death of glam at the hands of grunge and Randy’s girlfriend says ‘Like there’s something wrong with just wanting to have a good time?’ I think that gets to the heart of it. I think another people have with rehabilitating this stuff is that it doesn’t really function ironically – nowadays, everything is symbolic of something else, or operating on two levels. Glam metal is quite one-dimensional in the sense that if someone was going to act in that kind of larger-than-life way now they’d have to be a bit knowing and self-aware about it. Glam isn’t like that at all. 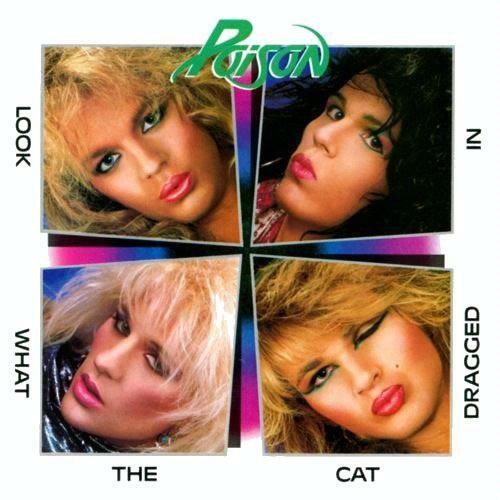 One criticism of glam metal was that it was sexist and/or objectified women, for example Warrant’s Cherry Pie video. Is there a place for glam metal in today’s society where such behaviour is finally being called out – in all walks of life? Shouldn’t we be condemning this kind of thing? Arguably yes, although I think you could equally make the case that pretty much the entire story of recorded music is one of women getting marginalised, exploited and not given their fair credit. While it’s portrayal of women might seem problematic now – and more than anything, it generally looks like gender relations as imagined by 15 year olds who’d never actually spoken to a woman – I’m not sure it’s any more or less offensive than most other genres. 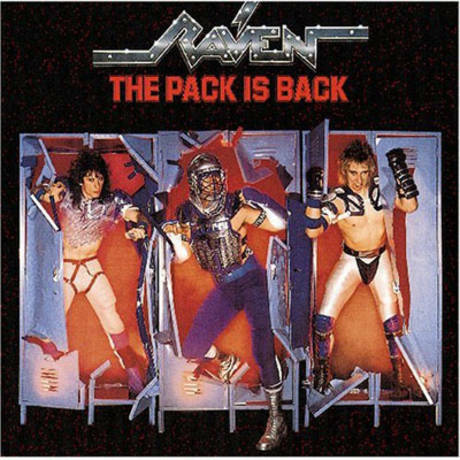 Why do you think Raven – a British metal band – thought it would be okay to wear make up and American football costumes? Was this just blatant selling out? Is that not something to be critical of? There’s a whole argument there about ‘authenticity.’ British metal audiences did bristle at this stuff a bit in the old days – Def Leppardalways got grief for doing that Hello America song – and I think a bit part of the appeal of people like Iron Maiden and Saxon and the whole NWOBHM as it persisted into the 80s was that it seemed a bit more individualistic and home-grown. But really, I think glam’s entire image was so ludicrous and performative that you can’t really say American football outfits are any worse than, say, blokes who’ve never ridden a horse wearing cowboy hats. With the benefit of hindsight, wasn’t it all just a bit odd? A blip? A mistake where a bunch of Americans got a bit carried away? Yeah, it really was strange. That’s a big part of what attracted me to it – not just the idea that it feels like a different era, but that it’s also difficult to imagine it happening anywhere other than the very specific time and place that it did. We both grew up in and around London and loved this music. Why do you think it appealed to us, and to many people like us, often to the exclusion of listening to other forms of music? Why would a bunch of strangely dressed guys from LA wearing bad make up appeal to people in the U.K.? I think people now forget how parochial and run down a lot of the UK was in the 80s (and even quite late into the 90s). And in that context, the life those bands portrayed – drugs, women, booze, strip clubs, that slightly outlaw quality – seemed weirdly glamorous. I mean, you can look at it now and think ‘who the hell would have been impressed by LA Guns?’, but if you were at school in Hanworth in the late 80s like I was, that life seemed pretty amazing. And the music had that double quality where it claimed to be the soundtrack for complete outsiders, yet was hugely commercial – so you could get the benefit of feeling like an iconoclast and a rebel, but actually be part of a pretty enormous scene. In the glam rock genre perhaps only Appetite for Destruction has remained popular amongst critics, possibly because it was such an honest chronicle of the times. Is there another album from back then that you think is timeless – even one that could be released now and have a huge impact? And was there one that was hugely overlooked? I’d agree that AFD is the key album – for me, it’s maybe the best rock album of all time. There’s almost no fat on it whatsoever, it’s an astonishing piece of music. The other contenders… I think the first Skid Row album is fantastic: they were always slightly written off as Jon Bon Jovi’s protege’s (and their hugely acrimonious fallout probably put a major dent in their careers), but it’s a superb album. I saw them live a few times around that period and they were a great live band as well. I’ve also got a real soft spot for the first WASP album: I saw them live a few months ago and I’ve got to say they were brilliant. I’ve no idea what Blackie Lawless has done to keep his voice in shape but he basically sounds as good as he did in 1984. And finally, which band was best: Ratt or Motley Crue? I’d have definitely said Ratt in the old days, but I think a lot of that is that all the circus around MC had a bit of a halo effect on the way they were perceived (I’m reading a lot of old back issues of Kerrang from the time and there was a lot of bad feeling towards them as they cancelled tours etc on fairly spurious grounds. But with working on the book I’ve gone back and listened to those Motley albums and they’re a lot better than you remember – heavier, too. Very good insight into that era and genre. I was into most of these bands at the time and though I paid little attention to the image, I loved the music. I hated this genre when I was around and don’t miss it a bit. When it was happening, I was in full U2, Sting, Pixies, Cult, REM mode. Appetite was the first album that made me think my metalhead friends had any brains at all. A year later, I upped the ante with Jane’s Addiction’s Nothing’s Shocking. Smashing Pumpkins’ Gish happened shortly thereafter. I’m pretty sure I won the argument. I shared a house at Uni with a guy who loved this scene and walked the walk, strutting around Liverpool in the 80s in PVC trousers and back combed hair – it took some guts (the strutting, not the sharing the house). It was absolutely clear even at that time that Appetite was an album apart, as it seemed to speak truths at least. The rest of the scene seemed like a pantomime and was at odds with much of British and European music at the time. I don’t think aside from the occasional track that it has stood the test of time. It has a similar depth to disco, but without the charm. Good piece of writing though. I am an unapologetic glam band/hair band fan. I came of age during this time, and have nothing but the happiest memories of the biggest hair and fastest guitars. It just fit at that time, and probably only ever at that time. Sure, people can distance themselves now, hanging back, pretending they didn’t, but people had a good time—perhaps not deep philosophically, but fun. I was pro-fun during my college days, and I turned out to be a productive contributor to society! Thanks for the book recommendation. Hi Wendy – thanks for saying hello. Good to see even us glam metal fans can make a positive contribution to society! Right? So many of my peers shy away from acknowledging their youthful folly (and spandex and leather fringe), but I am more of the “It was awesome at the time” mindset. That time was an important one in my evolution, and I own it. I was in graduate school at the height of the hair metal days, and I didn’t quite fit in with the look at the conservative university I attended, It was fun to shock people who judged me solely on appearance, and assumed I wasn’t very bright. That too taught me an important lesson about not judging the book by its cover. Thanks for bringing back these happy memories! Cheers! The whole ‘hair metal’ thing really gets on my nerves. It wasn’t just the ‘glam’ bands who had the hair back then. Some of the ‘thrash’ metal bands had bigger hair than the so called ‘posers’, yet none are derided in the same way as Poison, Crue, Ratt, Warrant et al. Growing up on a diet of Sweet, Slade, KISS, Angel, Van Halen and Starz (as did the majority of the bands), the likes of Kelv Hellrazer and I fully embraced that scene and loved every second of it; especially touring in the States with bands like Poison, Britny Fox, Warrant, Enuff Z’Nuff. ‘appy daze. I meant to mention to you Dave that I heard Angel’s “She’s A Mover” for the first time the other day. That’s a heck of a tune isn’t it? Is there somewhere (a book or magazine article) where their story is told? There was an extensive article I penned on the band way back in the K! days for the Mega Metal Kerrang! Glam special that was posted online by a friend of mine, but the images were hosted by imageshack and now unreadable. Great – thank you – appreciated. Didn’t the LA Glam look coincide with Hanoi Rocks’ first US tour? I always imagined that the bands had stolen Hanoi’s look but ignored the music. I wasn’t a fan of that era’s glam although Twisted Sister’s first album is a nailed on classic as is the first Motley Crue album. If glam was the epitome of nothing but a good time, grunge swung the pendulum in the other direction completely. It was just so depressing! I loved grunge throughout the 90s and I never understood why I was so depressed in my 20s. Alice in Chains stands to this day as one of my favorite bands of all time, yet I can only listen to so much of it as the lyrics are so negative.